There were 31 k miles on the bike and the final drive oil was changed around 28K, I had added too much oil, 230 ml instead of the new recommended 180 ml causing it to leak at a warm day off road. 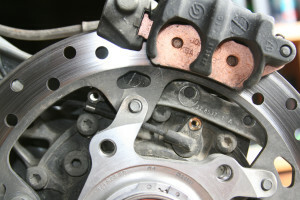 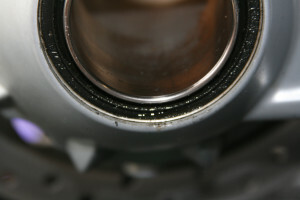 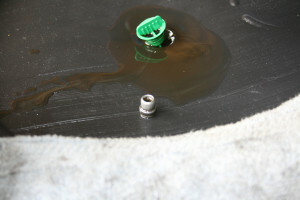 The original leaking seal shown below before the removal. 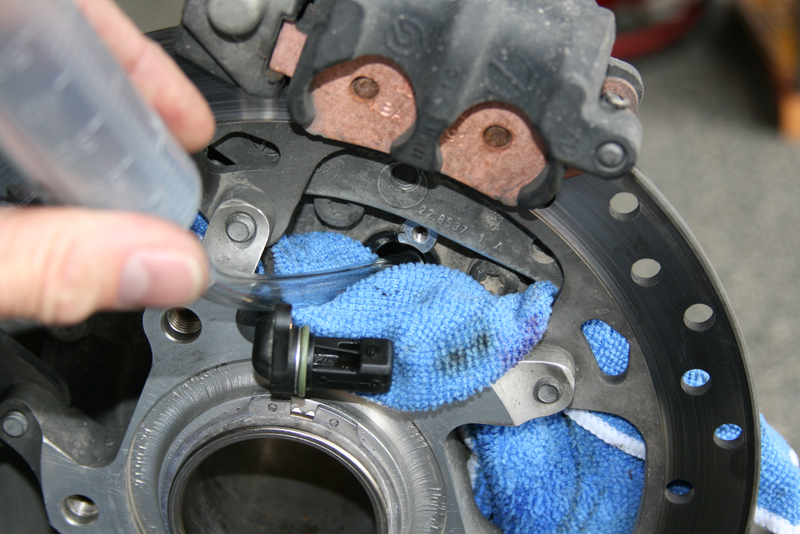 To start we have to drain the oil first, to do this you have take the speed sensor out first as well loosing the cable for the speed sensor. 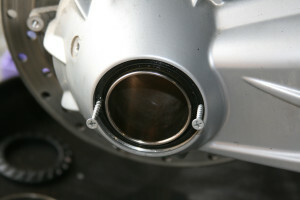 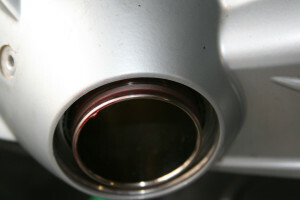 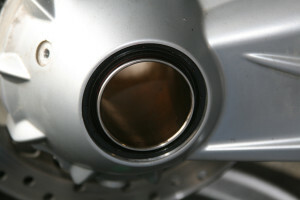 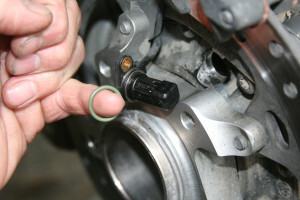 Note the o-ring and lock ring on the sensor. 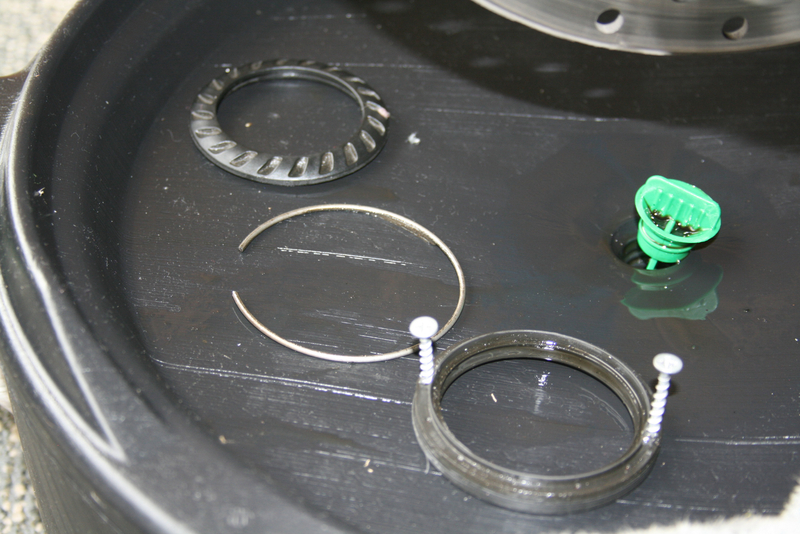 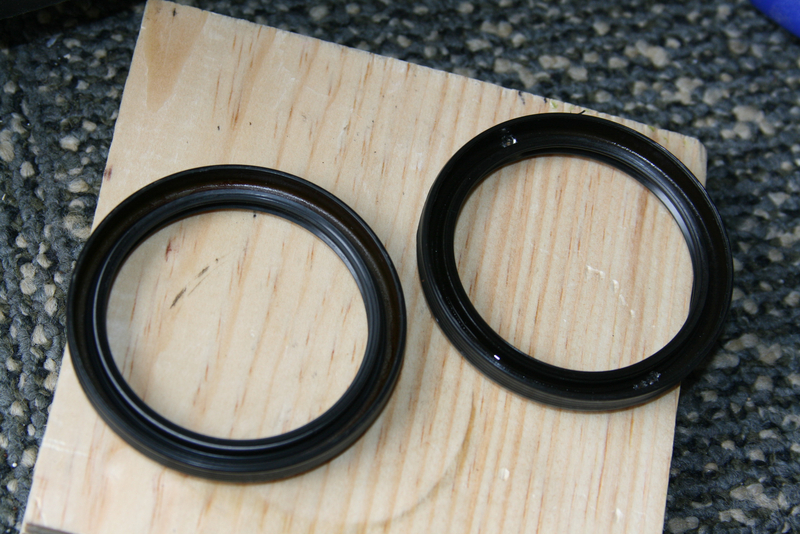 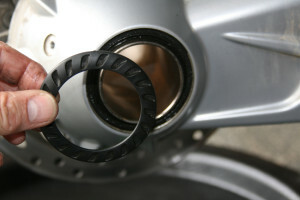 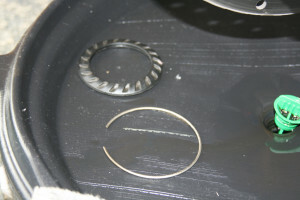 The lock ring can be re-used and o-ring should be replaced. 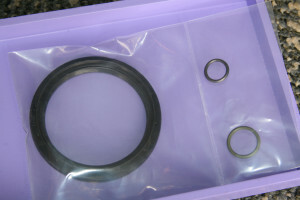 The new shaft seal and O-rings for the fill and drain purchased at the BMW dealer for $25. 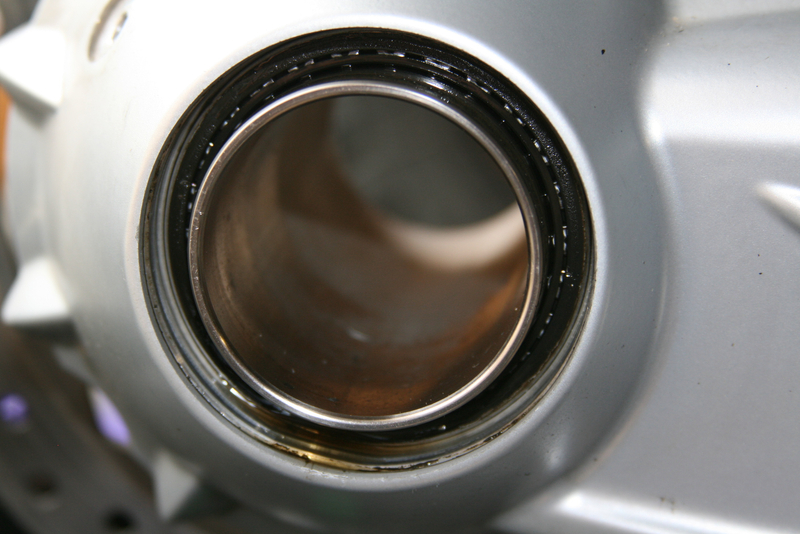 The drain plug is magnetic and will collect any metal particles in the oil, make sure to clean it before it is placed back with a new O-ring. 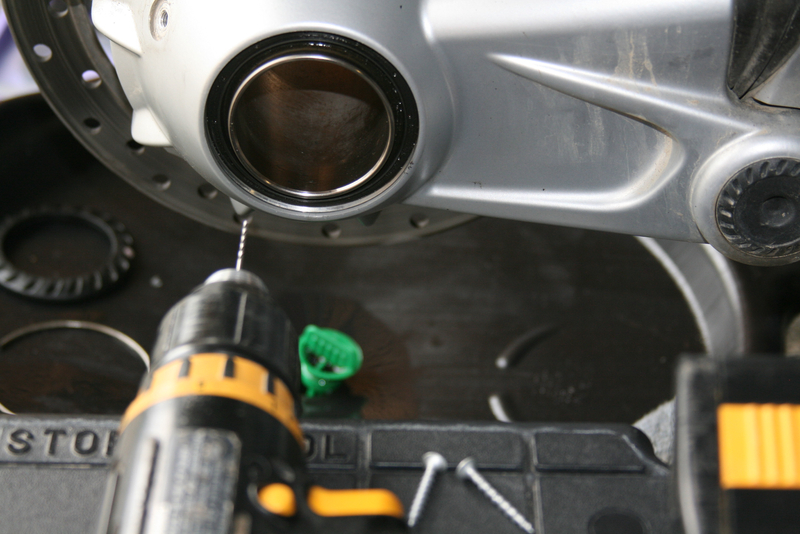 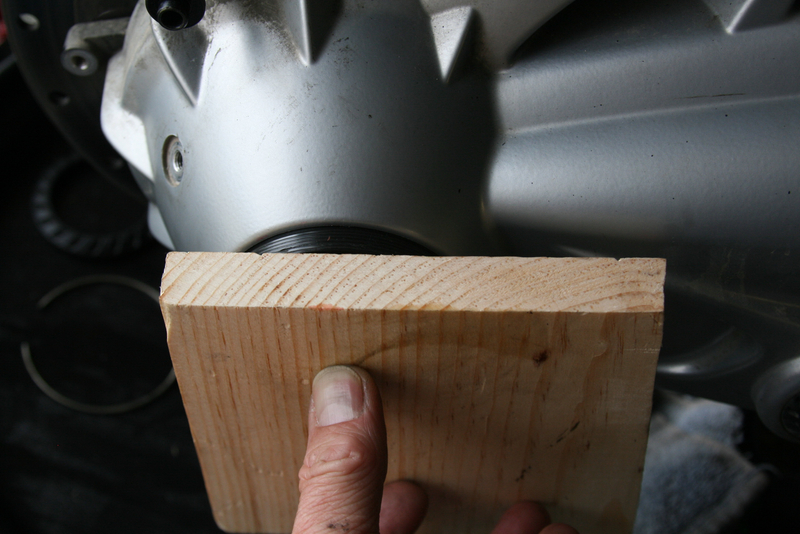 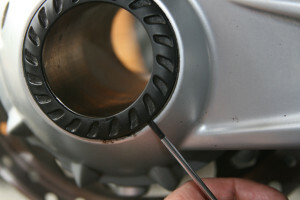 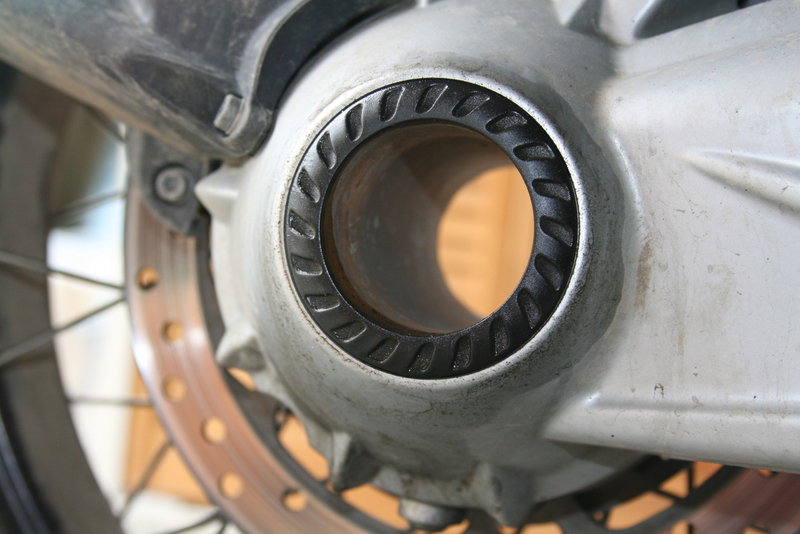 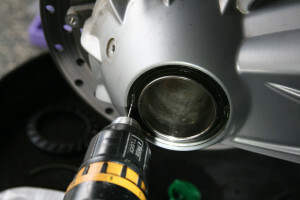 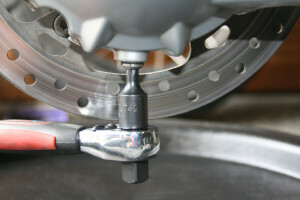 Remove the cover ring with a small screw driver and clean it. Take the lock ring out carefully with a small screw driver. 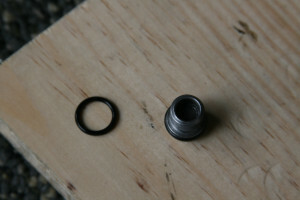 I drilled 2 small holes and used 2 wood screws to pull the shaft seal with a claw hammer and a piece of wood. 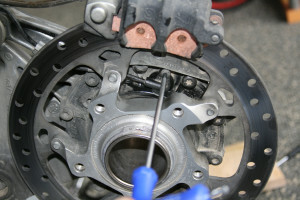 Here it shows the seal being removed. 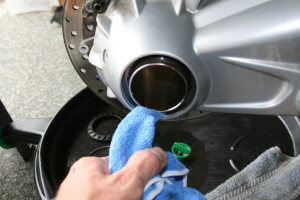 Clean the drive area with a cloth. 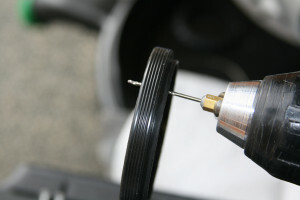 Save the old seal as it will be used to tap in the new seal! Add some gear grease to the shaft, just minimal to allow for a smooth fit. 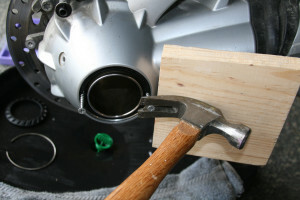 Installing the new seal with a small piece of wood, hammer and old seal as a guide. 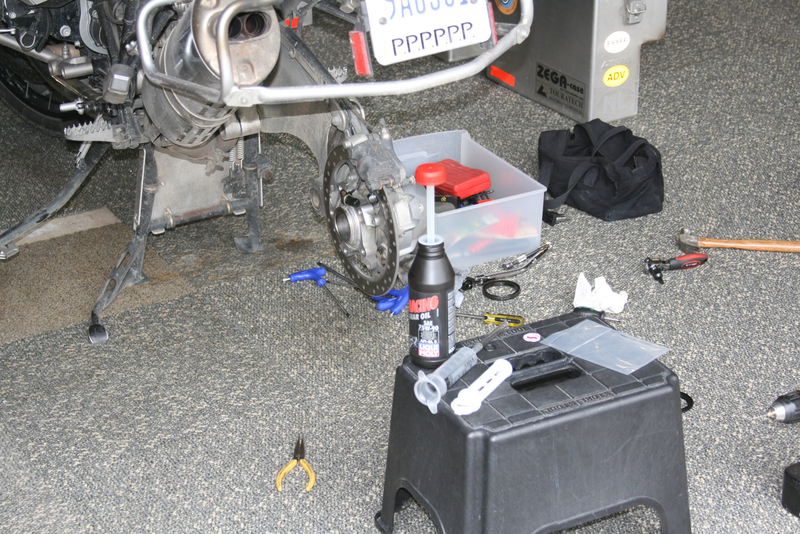 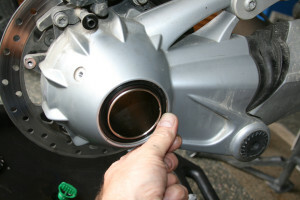 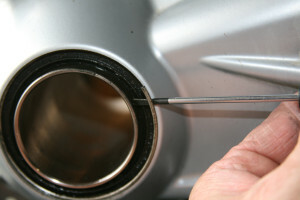 Place the lock ring back, wait with the cover until the oil has been added. 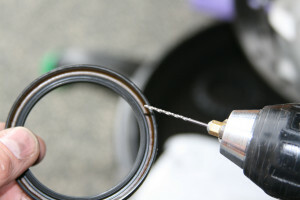 Place the drain plug with a new o- ring. 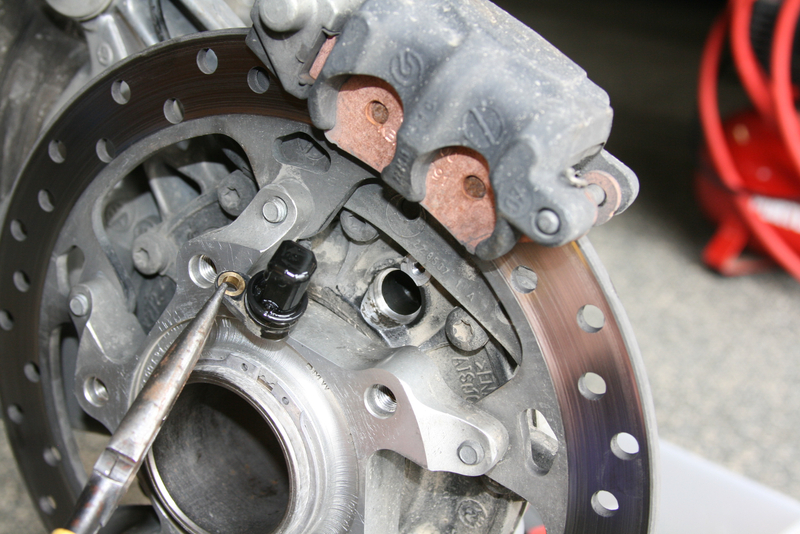 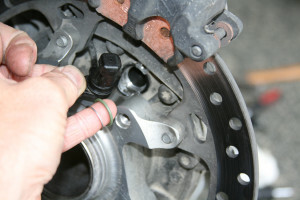 Clean the speed sensor and add a new o-ring, the lock ring will be re-used. 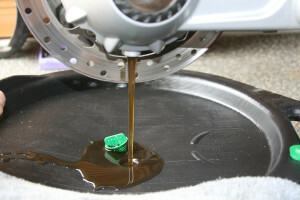 Apply a cloth to avoid spilling and apply “very slowly” the new oil as it can take up to 10 minutes without spilling. 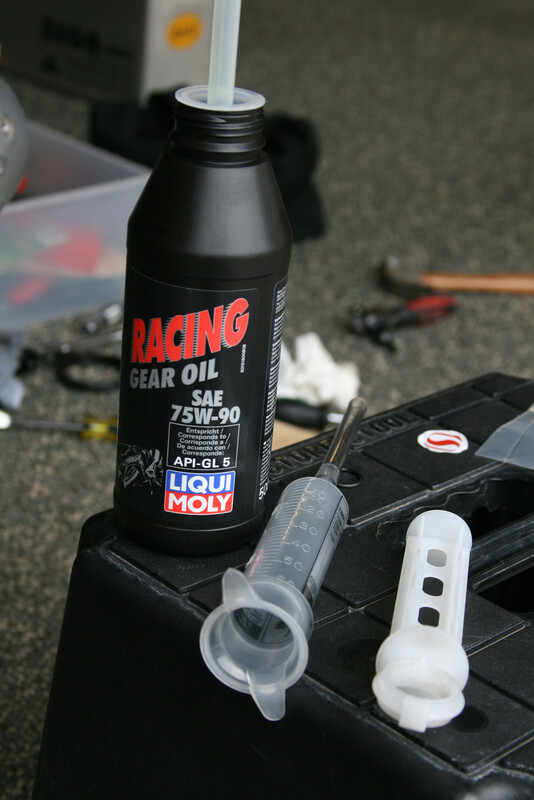 Add 180 ml of the SAE 75W-90 oil with a syringe of 60 ml and a small tube. And take your time…..Don’t forget to lock the sensor and sensor cable again.